Like many people, I ♥ NY. My family is from New York, so growing up we would go on annual vacations “back East” to visit family and friends. Now with limited vacation time, I try to make a trip as often as possible, but it’s never as long or as frequent as I would like. During a recent business trip, I had a few hours of free time and was prepared to take full advantage of it. A few days, let alone a few hours, is nowhere near enough time in New York, but my short visit provided a good opportunity to enjoy some of my favorite things about the city. Here are a few highlights (and perhaps a sample itinerary) from my 4 hours in New York. If the early bird catches the worm, then this early bird was not out for a worm, but rather a NYC staple: coffee and a bagel with cream cheese. There are carts on virtually every corner selling coffee (I like mine with milk) and assorted pastries and bagels (toasted, with cream cheese). Although a more simplified experience than the typical Starbucks crowd is used to (and far less expensive), for me this is a quintessential way to start the day in the city. 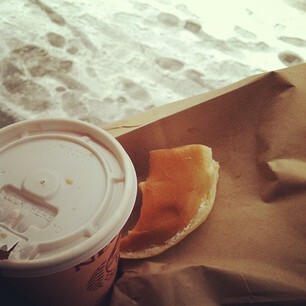 I usually like to grab my breakfast and head to Central Park for a leisurely stroll and some great people watching. Although the day I was there the weather was not necessarily in my favor (windy and wet snow), so I had to seek shelter under an awning. It’s nearly impossible to see the entire Met in one day, so if you’re short on time, it’s best to focus on a few collections that pique your interest. For me, this usually includes the Greek and Roman Art, 19th and Early 20th Century European Paintings and Sculpture, the American Wing or a special exhibit. Last fall I went to see the “Regarding Warhol: Sixty Artists, 50 Years” exhibit, and this time my mission was to check out the new “Impressionism, Fashion and Modernity” exhibit, which you can read more about here. 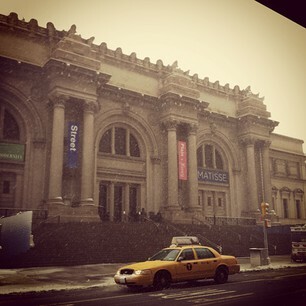 After the Met (and perhaps a little fashion inspiration), I was in the mood to do some shopping. A quick trip on the 4 or 6 train to 59th Street (pick it up at Lexington and 77th) and a short walk 3 blocks west back to 5th Avenue is the perfect place to start. From window shopping at Tiffany’s and Bergdorf Goodman (I’m obsessed with their window displays) to H&M, and everything in between, 5th Avenue is a mecca for shoppers of every taste and budget. 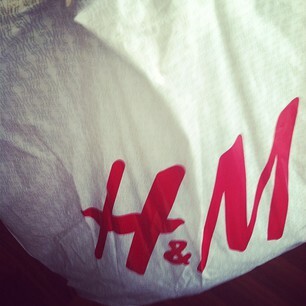 Since my time was limited, I ducked into H&M, bought a few basics and hit the streets again. Just as New York is a shopper’s paradise, so too is the city a foodie’s paradise. For a fast bite, you can’t go wrong with pizza. Since my end destination was Little Italy to pick up some cookies (more details below), I decided to head there to grab a slice (take the 4 or 6 train to the Spring Street station). For novelty, one place to try is Lombardi’s Pizza on Spring at the corner of Mott Street. The restaurant stakes its claim as the first pizzeria in America, having received its business license from the City of New York in 1905. If you’re pressed for time (like I was) or not in the mood for lunch, then Little Italy is also a great place for a quick coffee break. One of my favorite places is Caffe Palermo on Mulberry Street, where I bought a box of Italian bakery cookies to take home. 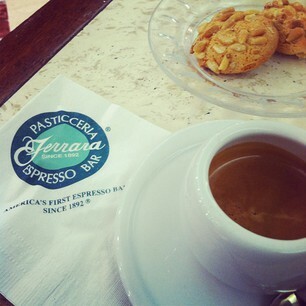 Another is Ferrara around the corner on Grand Street where I ordered an espresso and 2 pignoli (pine nut) cookies. This was just the pick-me-up I needed after a whirlwind day and before heading back to my hotel to grab my bags, hit the airport and return home. If you only had 4 hours in New York, what would you do, see or eat?